Will the US Station Long-Range Heavy Bombers in Australia? The United States wants to temporally station heavy bombers and aerial tankers in Northern Australia. The United States intends to regularly rotate long-range heavy bombers and aerial tankers through Australia in order to deepen defense ties between the two countries, the commander of U.S. Pacific Air Forces, General Lori Robinson, told reporters this week in Canberra, Australia. She also confirmed that high-level discussions are currently underway to discuss details of the deployment of U.S. military assets in the country’s north, according to the Australian Broadcasting Corporation. “We’re in the process of talking about rotational forces, bombers, and tankers out of Australia (Tindal and Darwin) and it gives us the opportunity to train with Australia,” Robinson said. The Australian government was quick to deny any such plans, insisting that the U.S. defense official had misspoken. This week, however, Australia’s Defense Minister Marise Payne, while evading a specific question on the likelihood of U.S. bombers rotating in and out of the country, emphasized that the U.S. Air Force will have a larger presence in the country in the future. “The Enhanced Air Cooperation Initiative, which is part of the Force Posture Initiative, is in development and will result in increased rotations of US Air Force elements through Northern Australia,” she said. Everything we do in this area is very carefully determined to ensure that our respective military forces work together as closely as possible in our mutual national interests. 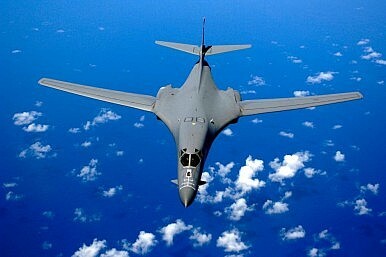 The U.S. Air Force does not currently operate B-1 bombers out of Australia. However, B-52 bombers have been rotated in and out of the country in the past by the U.S. military. “Peace, cooperation and development has become a major trend of the region that all people are aspiring for. Cooperation between relevant countries should focus on safeguarding regional peace, stability, and development. Any bilateral cooperation must not jeopardize a third party’s interests,” he added. What Do Asian Governments Think About the US Strike on Syria?After Trump Win, Australia Hopes for Stability in Relations With USUS to Dispatch Supersonic Bombers to South KoreaUS Air Force Deploys Supersonic Strategic Bombers to PacificIs Australia the Key to US Containment of China?